DateRangePicker is used in a combination with a UI-related DateRange that is initialized on clicking the control. 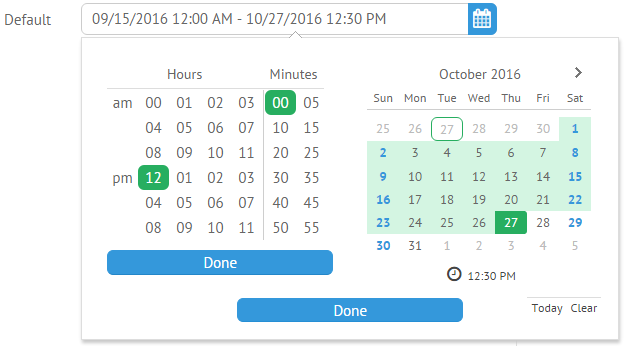 It allows choosing a date range and, optionally, time in the calendar for their further usage. format (string) - sets a date format to display in the DateRangePicker field. By default it is "%Y-%m-%d". You can customize the DateRangePicker popup by using the suggest property which links suggest date range with the input. You can set a particular time for the start and end dates of the range by clicking the clock below the calendars' grids. 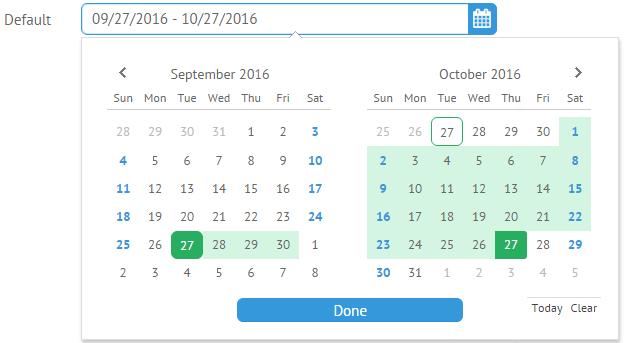 Note that the time selector will appear when you will select the necessary date in a calendar.